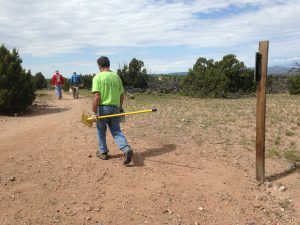 The Stewardship program provide the foundation to advance Santa Fe Conservation Trust’s mission. Working with willing landowners to acquire a conservation easement on private land is the first step to lasting protection and building partnerships. Once the conservation easement is in place, SFCT ensures the integrity of each easement through the ongoing commitment of our Stewardship Program. The Stewardship Program is governed by Board-adopted policies and procedures that integrate Land Trust Alliance Standards and Practices to form the ethical and technical guiding principles of operation and our commitment to upholding the public trust. Coordination with SFCT staff to identify a property’s conservation values to inform easement terms. Baseline Documentation Reports – Comprehensive property descriptions that document conservation values protected by the easement and the relevant conditions of the property as necessary to monitor and enforce the easement. Easement Monitoring – Annual visit and assessment of each conservation easement for changes in conditions. Easement Enforcement and Defense – If needed, to maintain the purposes of the easement. Record-Keeping – File maintenance, updates and reporting. Landowner Relationships – Partnerships with landowners to provide relevant information and services that advance stewardship of the conservation easement property. Also includes processing requests to exercise reserved rights. Strategic Stewardship includes community outreach and activities that enhance or restore conservation values of easement properties, increase SFCT staff’s value to landowner and agency partners, strengthen SFCT’s landowner relationships and increase our credibility as a conservation organization.